Roasted peanuts in a chocolate biscuit batter. These are a family favourite. They can be frozen and popped in the lunch box in the morning. ​Main ingredients: Butter, sugar, egg, flour, cocoa and roasted peanuts. ​A classic Kiwi recipe made and eaten by home cooks over the years. Main ingredients: Flour, coconut, brown sugar, rolled oats, butter and syrup. 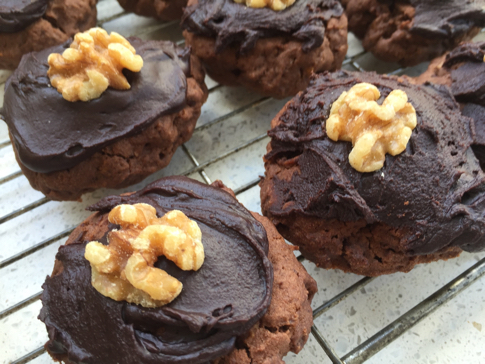 A hearty biscuit with delicious chocolate chunks and oats. This is one of my most popular biscuit. The chocolate chunks is Whittaker's dark chocolate block chopped into chunks and mixed into the dough. Main ingredients: Butter, condensed milk, sugar, flour, rolled oats, dark chocolate. 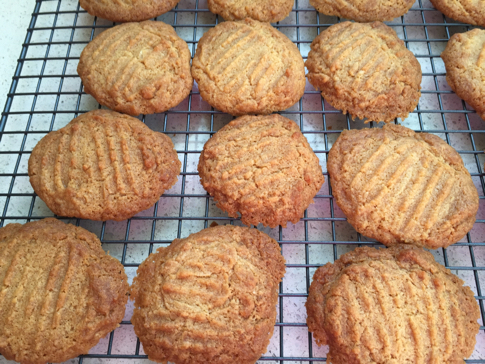 A very popular plain biscuit with a subtle honey flavour. Liked by both kids and adults . This makes a very large batch and we recommend that you freeze part of it. Main ingredients: Butter, honey, sugar, flour. A traditional chocolate biscuit with crunchy corn flakes and chocolate icing on top. These can be ordered with or without walnuts. Main ingredients: Brown sugar, egg, butter, flour, cocoa, baking powder, coconut, corn flakes, icing sugar and walnuts. This is a fabulously crunchy cookie filled with coconut and rolled oats to make it sustaining. Main ingredients: Butter, sugar, rolled oats, egg, flour, chocolate chips and coconut. This is a decadent biscuit filled with lots white chocolate and macadamia nuts. They freeze and keep in the pantry amazingly well. We consider these to be a real treat but well worth it every so often. Main ingredients: Flour, butter, sugar, egg, white chocolate, coconut and macadamia nuts. A crisp biscuit with a hint of orange flavour mixed with dark chocolate and oats. These are my family's favourite and they freeze well. Main ingredients: Butter, sugar, orange rind, egg, chocolate chips, rolled oats and flour. These are a crisp and crunchy biscuit with a salty peanut taste. The sweetness of the chocolate chips are offset by the taste of the salty peanuts! A great combination. Main ingredients: Butter, brown sugar, caster sugar, vanilla extract, eggs, flour, dark chocolate and salted peanuts.